You're probably wondering which software to use with your new digital photos. 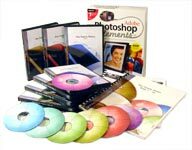 We can provide you with fully functional, industry standard software that makes having a digital photo collection truly a joy. Other companies give away free ware with their product. We think our customers deserve more. That's why we've become an Adobe® Authorized Reseller. Our software offerings are sure to please everyone from the Hobbyist to the Professional Photographer. Please take a minute to learn more about our software offering by clicking on a product below. Do more with your digital photos and movies with smart, easy-to-use software from Adobe®! The professional standard in desktop digital imaging! Get Superior results faster and take advantage of indispensable new features for photography, graphic and web design, and video. Adobe, the Adobe logo, Adobe Premiere, Photoshop, and Reader are either registered trademarks or trademarks of Adobe Systems Incorporated in the United States and/or other countries. Intel and Pentium are trademarks or registered trademarks of Intel Corporation or its subsidiaries in the United States and other countries. Microsoft and Windows are either registered trademarks or trademarks of Microsoft Corporation in the United States and/or other countries. Palm OS is a registered trademark of Palm, Inc. All other trademarks are the property of their respective owners.